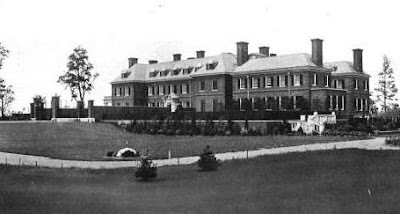 Mattinecock Point, The Long Island residence of J. P. Morgan, Jr. at Glen Cove, New York. Here is an early view of the J. P. Morgan, Jr. estate on Morgan's Island. Click HERE to see more photos and to see it before it's demolition. Click HERE to read about the decline of the Gold Coast in Holiday Magazine. A very beautiful home seen prior to the additions that were constructed when the property became a novitiate for the Sisters of St John the Baptist. This one should not have been torn down in the 1980's. There were so many options for its re-use. A sad loss. After the dismantling of the interiors I have always wondered where the staircase components, the marble mantel with the exquisite caryatids and the ornate dining room panels ended up?